In this post I describe how to implement the classical incremental refresh scenario for the cloud data sources in Power BI Service for Pro accounts. Step by step. It worth to read. As I wrote in the previous post, we can implement a semi-incremental refresh for Pro accounts in Power BI, using just dataflows. The method I described has a main lack: although the “historical” dataflow remains unchanged and will never load data from the source again, the “refreshing” dataflow will load the whole “fresh” part of data repetitively until you change the date intervals manually. …but, after some consequential refreshes, it could become significant, and not so fresh. You can again split “fresh” it in the two parts – “new historical” and “fresh”, and so on. But this is only SEMI-incremental refresh, and, of course, is not a good solution. It seemed that implement a complete, classic incremental update using just dataflows is impossible. But, after some investigations, I found a solution which helps to implement the classical incremental refresh scenario, where the fresh data part remains small and fresh, and historical part become updated without querying a data source. At least for the cloud data sources. After I published previous blog post about an incremental refresh for Pro accounts in Power BI, Microsoft MVP Parker Stevens from BI Elite channel kindly asked me to record a video for his channel. So here it is. Here I not only introduce Power BI dataflows and describe the semi-incremental refresh concept, but also show how it works in Power BI Service. To my surprise, it has almost 1500 views in two days – not so bad 🙂 I understand that this happened because of hype topic, but, well… now I know how to remove some limitations and perform a CLASSICAL incremental refresh for some types of data sources. Blog post follows. Incremental refresh is a high-demand option in Power BI. Microsoft already provided it for the Premium capacities, but for the Pro accounts it is still in waiting list. However, with introduction of dataflows in Power BI Service, an incremental refresh implementation becomes available for Pro accounts too. I won’t to describe dataflows in detail here since there is a lot of blogs and resources about it (but I’ll provide a few links in the bottom of the post). Dataflow in Power BI Service is a set of web-based Power Query queries (named as ‘entities’). Each dataflow could be refreshed manually or by the its own schedule. The result of evaluation of a dataflow’s entities then stored in Azure Data Lake Storage Gen2 as tables (more precisely as CSV files). Then you can use dataflows (their entities) as a data sources in your Power BI dataset. Let’s start from this point. What is the incremental refresh at all? In simple words, it means that in the single data import action we are refreshing (updating) only the part of data instead of loading all the data again and again. In the other words, we are dividing data in two parts (partitions): first part does not need refresh and should remain untouched, second part must be refreshed to bring in updates and corrections. Let’s say you have a few numerical columns [A], [B] and [C] in your table and want to sum them to the new column in Power Query or Query Editor in Power BI. But if in this table we want so sum columns [A] and [B], we are not expecting a pitfall, aren’t we? The reason of this behaviour is simple and it reveals itself when we look at our data a little bit close: there is a null in column [B] in that row. In Power Query formula language (M) the expression null + value always returns a null (see this excellent post of Ben Gribaudo about null type and operations with null values). List.Sum function used in this case ignores null values and sums up only numerical values. Indeed, it gives more intuitive result, but on the contrary has not such intuitive syntax of simple addition. I do not know what is the reason of such difference, and already complained to the development team. But if you rely on the buttons there, then you have to be aware of such behaviour. If the logic of your calculations assume that value + null = null, then you should use simple + symbol between column names. THE SAME BEHAVIOR Power Query shows when you’ll try to multiply two columns and three or more columns: with two columns there will be the simple * symbol, with three or more columns there will be List.Product function used. This is a very short post, just to make a reminder and possibly expand knowledge for me and my readers. Sometimes, specially when working with calendar tables, we need to calculate ISO Week Number for certain date. There is no native functions in Power Query / M language / Power BI to get ISO Week number, so to obtain the desired result you need to write your own function. List.Generate is the powerful unction of M language (the language of Power Query aka “Get & Transform” for Excel and Power BI query editor), used for lists generation using custom rules. Unlike in other list generators (like List.Repeat or List.Dates), the algorythm (and rules) of creation of successive element could be virtually any. This allows to use List.Generate to implement relatively complex get & transform tasks. Will you receive a list of four elements? Do you want to use an optional selector? Really? Why not? Generates a list from a value function, a condition function, a next function, and an optional transformation function on the values. Start value CurrentValue is the result of initial function evaluation. Pass CurrentValue to condition function, check the condition and return true or false. Ifcondition = false then stop list generation. If selector is passed to List.Generate and not is null, then pass CurrentValue to selector and evaluate its result. Else (no selector at all or it is null) then the next element is equal to CurrentValue. Evaluate next function with CurrentValue argument, and assign it’s result to the CurrentValue, so the new CurrentValue is evaluated next(CurrentValue). As you can see from this not-so-technical description, the important difference of List.Generate from other iterator functions of M language is that almost all of others working in “For Each…Next” style (they have a fixed list to loop over), while List.Generate uses other logic – “Do While…Loop”, checking the condition before loop iteration. Subsequently, the number of elements in created list is limited only with “While” condition. initial funciton has no arguments and its evaluated value is equal to its excression value. Even when you try to write the initial function with arguments you cannot pass any argument to it, because it called somewhere inside of List.Generate. To be honest I do not understand why initial IS a function but not a simple expression or value. May be there are reasons for it. But, if the first call of condition function will return false, a list will not be created despite the initial function was evaluated. In case of condition result is true then evaluated initial (or evaluated selector) will be the first element of the list. That’s why initial and next usually return same-structured values of the same type. condition, next and selector got evaluated CurrentValue as an argument, but they don’t have to use it. Actually these three functions clould ignore CurrentValue, and use some other logic behind. But, to be honest, I can’t imagine a situation when condition (or next ) do not use CurrentValue, because it leads to endless loop or list won’t be created. selector evaluated despite of the result of next evaluation on the current loop iteration. next always evaluated BEFORE the subsequent list element will be created (2nd and following). API will be called at least once (when initial is evaluated). It is convenient when both initial and next return value of type record. This greatly simplifies the addition of counters and passing additional arguments for these functions (for example, one of record fileds is main data, second is counter, etc.). Recently I posted about UsedRange trap when importing from Excel sheet in Power Query (you can read this post there). Please add your votes to these improvements – I’m sure they can not only save you a few rows of code but also can save you from potential pitfalls when working with raw Excel data. 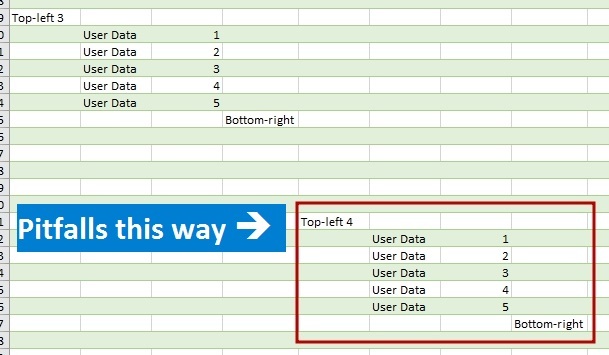 When you import data from an Excel workbook to the Power Query or Power BI from entire sheet, be careful, there is a pitfall. In the first case, a Table object is already structured data with columns’ names, automatically transformed to PQ tables. In the second case, Power Query shall give the named range generic titles (Column1, Column2, etc.) and then work as before. However, it is often the case that data are not structured in a formatted table or named range, and it can be difficult to transform them to such view before import. There can be many reasons for that, e.g., cells format is to be saved (merged cells are no longer merged after transformation) or there are too many files to transform them manually. The question is: what data range will be retrieved in that case? There are 17 179 869 184 cells on an Excel sheet (16 384 columns and 1 048 576 rows). If Power Query try to get them all, there will be huge memory consumption and performance leak. However, we can ensure that usually number of imported rows and columns is about the same as the number of rows and columns with the data may be slightly bigger. So how Power Query defines a data range on a sheet? The answer is out there if you familiar with VBA macros and have enough experience with an Excel object model (but I think you will not be glad with this answer). A few days ago a client asked me if it is possible to dynamically change series displayed on Power BI chart. My first (instinctive) answer was “Yes, of course, you can use a slicer to select which series you want to show, just put desired column in a slicer visual”. But then he added details: he wanted to select a measure to display on a chart, not to filter a value from column. My second (instinctive) answer was “No, you can’t. You can only filter a column, and can’t place measures in a slicer”. But after a little chat I started to wonder whether it is really impossible. If we put a measure in a “Value” well of chart fields, it will be shown as a series (for example, some [Total Amount] measure). What my client is actually wants? He want to choose some elements on the slicer and, if one element selected, to show a measure. If that element is unchecked, then don’t show a measure. Actually, those slicer’s elements are unique values from some column. A slicer applies a filter to that column. Can we catch whether a column is filtered? Yes, of course, we can do it with DAX. And if some desired value is selected, we just need to show a measure as a series. As that measure is already in the “Value” well of a chart, then, in other words, we just have to “do nothing”. So, we only need to somehow hide a measure if a desired slicer’s element didn’t selected.